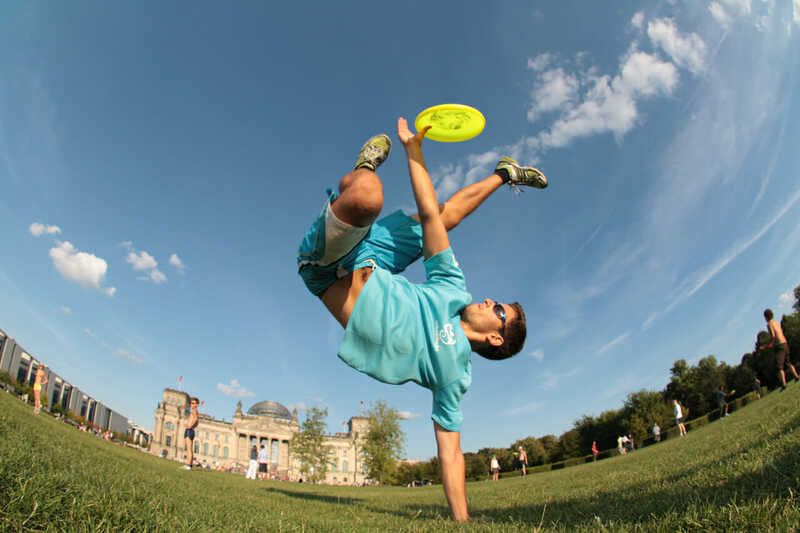 This article was written by Ken Westerfield, a long-time freestyler and disc sport enthusiast. The article is presented by Five Ultimate; all opinions are those of the author. Please support the brands that make Ultiworld possible and shop at Five Ultimate! In the early days of Frisbee before the advent of disc sports, the original attraction was simply to watch the Frisbee fly. At first, this was enough; the sheer joy of watching a disc soar, not at all like a ball. Then, because it’s in our nature to compete, came the games. If you enjoy playing one disc game, chances are you’ll enjoy all the disc games because they all have that one common attraction: unlike the ball, the disc actually flies. Each game demands unique skills but also shares common skills from the other disc sports. If you become skilled in one, you’ll quickly excel in the others. 1. Disc freestyle is an excellent, non-competitive athletic disc activity. Having grown up in the ’50s and ’60s playing and competing in a variety of traditional sports, what attracted me most to playing with the Frisbee was that it didn’t have to be competitive to be athletically challenging. Disc freestyle play is an endless variety of throwing and catching possibilities with skills that can be displayed. Freestyle accomplishments can be as challenging and satisfying as a win/lose competitive “keeping score” game. Accomplishments and rewards are based on nothing more than your ability to improve; gratifications come from accomplishing the goals you set for yourself. 2. There are endless ways to play. “Play Catch—Invent Games. To Fly, Flip Away Backhanded. Flat Flip Flies Straight, Tilted Flip Curves—Experiment.” Those were the instructions printed on the bottom of every Frisbee since the 1950s, promoting disc games and freestyle play. My first disc sport was freestyle in the 1960s. As new disc sports like ultimate, disc golf, double disc court, and overall events were introduced to the scene in the early 1970, I quickly adapted and did well in these new sports because many of the disc skills needed were skills that transferred directly from playing freestyle. The throwing and catching skills used in today’s ultimate are not so different from the throwing and catching skills we used in yesterday’s fast-freestyle. The fast throwing variety, lay outs, and sky catches make ultimate one of today’s most exciting sports. Without the use of nail-delay aids, freestyle, like ultimate, becomes a similar game of fast throwing and catching. I think ultimate players would not only like this type of “fast-freestyle” but benefit from it. In the 1960s and early 1970s, before the rise of nail delay techniques, catching possibilities in freestyle would depend on the throw you were given. It was always spontaneous, unpredictable, and very fast. Play of this type of fast-freestyle was performed with two players standing 30-40 yards apart. The throws were fast and varied and, except for the occasional kick or slap-up, the catches were right off the throw with rarely a pause in between the catch and the throw back. At advanced levels, it wasn’t about what you did as much as it was about how you did it. The throws and catches would become a flow that was created once you mastered the basics. The flow and style would then become your play. It was fast and fluid, similar to martial arts and dance. 3. Adding throw and catch (no nail-delay) fast-freestyle to your ultimate training can be a fun way to add variety. Freestyle play in professional sports is common. Before baseball practices, players sometimes play a game called pepper. Basketball practice can look like a Harlem Globe Trotters exhibition with a freestyle dunking contest. Most sports have a fun freestyle component, evolving from a competitor’s natural tendency to challenge their own abilities. No sport is more accepting of a freestyle activity than that of throwing and catching a flying disc. In the early days of ultimate, some of the best players were also some of the best freestylers. A coincidence? I don’t think so. Many athletes add weight/strength training, martial arts, and many other activities to improve their physical abilities for their sport. Freestyle is a great way to add a different but complimentary exercise to your sport. 4. Disc fast-freestyle play will increase your confidence. A baseball player will warm up by swinging two or three bats together before going up to bat, mentally making the bat feel lighter and improving confidence in the swing. Similarly, playing and progressing in your freestyle practice will give you that same additional confidence in your disc skills when playing ultimate. What’s welcoming for new players in the sport of ultimate is that you don’t have to have great disc handling skills to be an effective player. As a beginner, having a good vertical leap, speed, and the willingness to lay out will find you a place on any ultimate team. But if you decide that you want to make ultimate your sport, then you’ll want to have the best disc skills you can get. To play championship level ultimate, you must have confidence in all of your playing abilities. If you have any disc related weaknesses, it will be noted and exploited by an experienced opponent. Having a specific exercise for practicing general disc skills — along with more standard throwing drills — will help you develop excellent handling abilities. Freestyle doesn’t have to be a strict practice, although it can be. It could also just be more of an experimental attitude whenever you feel like playing with the disc. 6. Learning freestyle-only throws will expand your range on the ultimate field. Fast-freestyle throwing experience can improve your throwing and quicken your ability to transition between your catch and throwing readiness. The throws you know today as ultimate throws — backhand, forehand, hammer, scoober — are what we use to call freestyle throws. Trying freestyle variations of these common ultimate throws, like under-the-leg or behind-the-back flicks, forehand and backhand high-arching curves and skip shots will expand the range of your throwing ability and increase your throwing possibilities on the ultimate field. Even though you wouldn’t use all of these throwing techniques specifically, just adding these freestyle throwing variations in practice will improve your throwing strength, comfort with varied release points, and general feel for your throws. This can be especially useful for playing in adverse conditions (wind, rain, cold, or against a great defense). Here are some examples of fun freestyle throws. 7. Learning to make freestyle catches will do wonders for your hands. When you’re running down the ultimate field under a disc, about to make an offensive catch against a defender, most of the time a two-handed or clap catch is not possible. It’s usually an obstructed one-handed catch. In fast-freestyle, one-hand catches are always obstructed by your own body, with many catches actually being blind (when you can’t actually see the disc go into your hand). When I played ultimate, my question to my team would always be: “Why do you use two hands to catch?” If the answer was that they were afraid they would drop it, that would be the wrong answer. I would then give instruction on the physics involved in catching the spinning disc with either hand. I’ve seen ultimate players at the highest levels sometimes have trouble reading the spinning disc and on occasion try to catch it on the wrong side of the spin. Some basic freestyle catches are behind-the-back, behind-the-head, or under one or both legs, front or backwards. All of these catches can also be done while jumping, running, or spinning. Freestyle catching is a great way to practice one-hand catching the disc on the correct side of the spin in many different positions. 8. If you want to keep your disc skills, you have to use your disc skills. During the off-season, indoors in colder climates, and when you have limited space, the occasional fast-freestyle play will keep your disc skills sharp until your next ultimate game or season. Of course you need to practice your offensive and defensive strategies, your give-and-go’s, your weaves, and your conditioning laps, but add a little basic throw-and-catch fast-freestyle practice and it will definitely make you a more disc-skilled player. Comments on "Tuesday Tips: 8 Reasons To Add Freestyle To Your Ultimate Training, Presented By Five Ultimate"